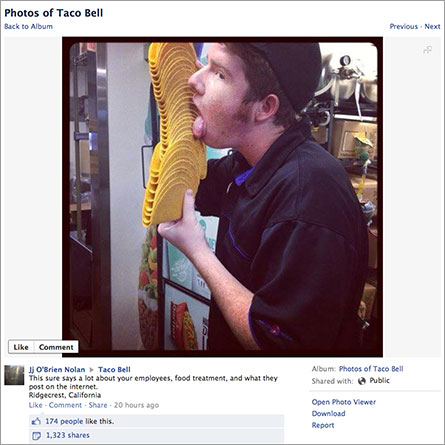 Taco Bell is saying it believes a photo posted to its Facebook page of an apparent employee licking a stack of taco shells is a prank but it is “conducting a full-scale investigation.” A photo of a man in uniform in a Taco Bell restaurant is seen licking a stack of about 30 taco shells. A spokesman for Taco Bell, owned by Yum! Brands, said the company is investigating in which store the photo was taken and will issue a full statement. Taco Bell employee pulls a Michael Douglas and goes viral.. This entry was posted on June 4, 2013 at 5:46 am and is filed under Uncategorized. You can follow any responses to this entry through the RSS 2.0 feed. You can leave a response, or trackback from your own site.